Hi, I'm Amber, but my friends call me Tiff, short for Tiffany, my first name. Writing had always been a hobby, a way for me to express my innermost thoughts and feelings in a way I sometimes find difficult with the spoken word -- although my friends will tell you 'shy' is not in my vocabulary. 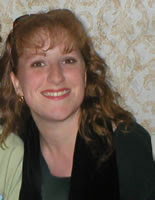 Thanks to the gentle nudging of a fellow author -- Tracie Peterson -- in 2002, I took the next step in my writing career and joined the American Christian Fiction Writers. I owe all so many there a hearty hug of appreciation for their constant encouragement and unselfish assistance. I feel a lot more confident thanks to their support and love. For those of you who are also fiction writers looking for a wonderful support group, check them out! I got involved with web design in 1997, when I was asked to take over running the official web site for the television series Dr. Quinn, Medicine Woman. That eventually led to a series of negotiations where I was offered the job of running world-renowned actress Jane Seymour's official fan site. That has branched into doing web sites for a variety of clients, including: authors J.M. Hochstetler, Trish Perry, Kathy Pride, Louise M. Gouge, Susan Page Davis, and Jill Elizabeth Nelson, actor William Shockley (the voice of AT&T and Sony) and many others. With the help of a handful of other web site "technos," Eagle Designs was born! Feel free to visit and see our other clients. Books are a definite passion. Why else would I be writing and publishing them? I firmly believe that a good book can take you away from all of your problems, into a world you've never seen. My favorite food is Italian; I sing all the time, and I once worked with my church choir to do a professional recording for a music CD of our performances. I am in my 30's, married the love of my life in July 2007, and live in beautiful Colorado, but I love to travel and visit new places. Ultimately, my dream is to own horses and live in a one-level rancher nestled in the mountains. For now, I will remain where I am and do what I love—design web sites and write. Raelene Strattford knows God has promised never to leave or forsake her. But after the catastrophic deaths of her parents, she doesn t believe it. What kind of God would take a girl's family and leave her alone in a wild land where women have no voice? Gustaf Hanssen has admired Raelene from afar for a while, but his poor attempt at courting her in the past has made him unwelcome in her life. When Gustaf promises Raelene's dying father that he will take care of her, he finds himself bound to her happiness, her success, and her well-being in ways he never imagined. To keep his word must Gustaf really oversee all of Raelene's affairs, find her a husband, and maintain her farm, while she does nothing but scorn him? Can God reach through Raelene's pain and self-centeredness and give her the love that awaits, if only she will accept His will? I found that the total disdain for a girl trying to go about her business seemed a bit over the top. It was necessary for the story line, but I didn't think it was completely realistic. Raelene's journey of disillusionment against God for taking her parents was well written. Overall, a light read. 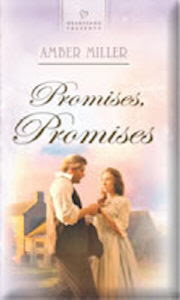 At this time, Promises, Promises can only be purchased through the Heartsong Book Club.